The ITS solutions company AGD is showcasing how it’s helped an English council to improve pedestrian crossing safety using radar technology to detect people movement. Cambridgeshire County Council wanted to improve the safety of its pedestrian crossings in areas of high demand and help ease cycle congestion at city centre junctions and engaged traffic signals consultancy Green Signals to set up two trials using volumetric detection technology from ITS expert AGD Systems. While it has always been possible to timetable special conditions for large volumes of pedestrians to cross the road by extending the invitation period at fixed times at periods of high demand, this is clearly an inflexible solution that does not allow for unpredicted fluctuation in pedestrian numbers. For example, what happens when school’s out earlier or later than usual? In many cases, the efficacy of the crossing is compromised, and so is the safety of pedestrians, cyclists and motorists. Cambridge, with its many university campus sites, is a prime example of an area with large transient pedestrian numbers using crossings throughout the city. Students can emerge at any time during the day or early evening, often in large numbers, making these locations more difficult to timetable. The companies realised puffin and toucan crossings go some way towards adding efficiency with their extended red period, but this does not always cater to the number of people waiting to cross. These crossings also employ pedestrian detection that cancels unwanted demands, which improves both pedestrian safety and traffic flow. 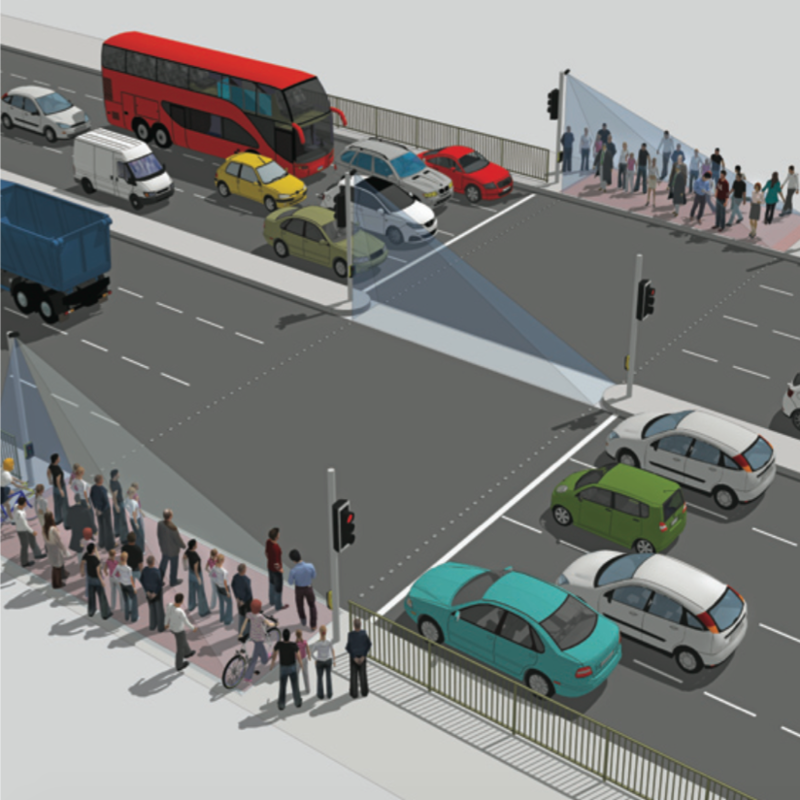 What Cambridgeshire County Council needed was a solution that could provide an indication of how much demand there is for a particular crossing, in real time. They wanted the flexibility to increase the invitation period, giving priority to pedestrians when suddenly there isn’t enough room to accommodate the people waiting to cross and those trying to pass them on the pavement. In the past there has been provision to allow traffic signal controllers to make dynamic adjustments to the invitation period, but until now the technology has not been able to provide credible information. However, using the 645 Pedestrian Detector from ITS specialist AGD Systems, Green Signals Consulting came up with a ground-breaking solution. Two trials took place using the 645 Pedestrian Detector. The 645 was recently enhanced to include the capability to provide optical volumetric data that enables the controller to select the appropriate pedestrian green time from a range of options. At Long Road in the Cambridge suburbs, one particular site – a toucan crossing close to a sixth form college – experiences high variation in pedestrian flows, as Green Signals senior engineer Chris Kennett explains, “At this site, you get substantial numbers of pedestrians arriving at almost any time of the day, while in between times the crossing is quiet – although the road itself is very busy. This junction can see several thousand cyclists go through every hour, and it’s not unusual to see hundreds waiting to cross at the lights. “The cyclists stop on red and wait for a green cycle filter that lets them go before the rest of the traffic gets the green light,” explains Kennett, who was instrumental in creating this innovative solution during his time with Cambridgeshire County Council. Rather than checking for cycle occupancy once and giving the cycle green phase if required, the 645 now enables the controller to check the level of occupancy while the green filter is on, and to extend the cycle filter phase until the threshold is met. “It’s proving to be very effective,” says Kennett.